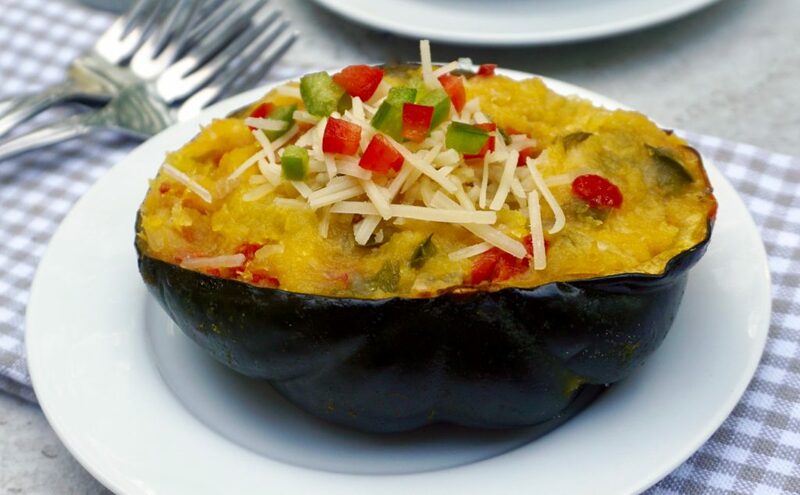 Twice Baked Acorn Squash is the perfect side dish for fall dinners. Twice Baked Acorn Squash is an ideal fall recipe. 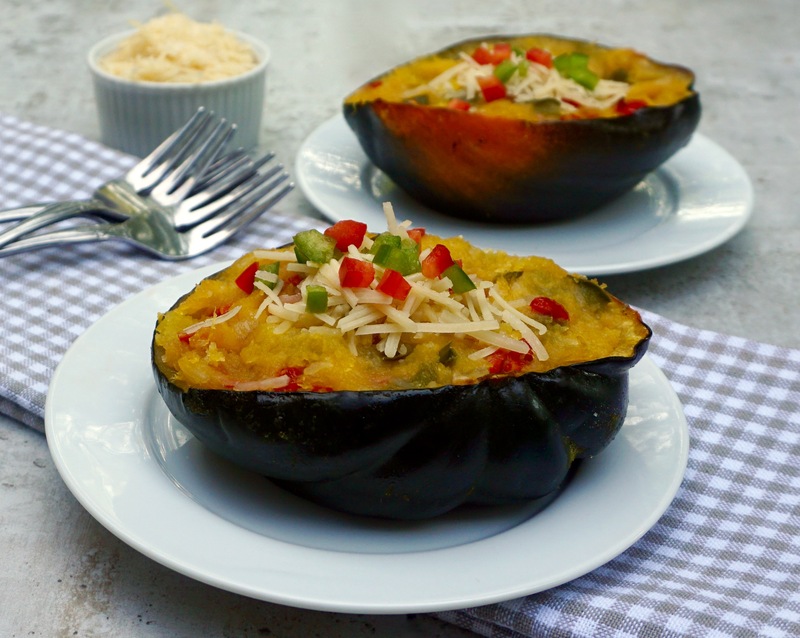 The acorn squash is baked and then scooped out of the shell, and mixed with bell peppers, onions, brown sugar and parmesan cheese. The mixture is then placed back into the squash and baked again! 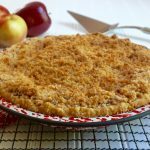 What I like about this recipe is that it can be made ahead of time without losing any of the delicious flavor. It will make a great side dish for your fall dinners and it’s perfect for Thanksgiving as well. You can actually make this and freeze it up to a month out, which is a huge help during the holiday crunch! Easy, delicious and freezer friendly. It is everything you need in one perfect dish! Line a baking sheet with foil and either spray with baking spray or spread with a little vegetable oil. Place the squash halves cut side down onto the baking sheet. Bake for about 45 minutes until the squash is cooked through and soft. Remove from the oven and cool slightly. In a small skillet, melt the butter over medium low heat. Add the green bell pepper and red bell pepper to the pan and cook for 3 minutes, stirring occasionally. Add the onion to the pan and cook for an additional 2 minutes. You want them to be soft but not browned. Scoop the cooked squash from the shells carefully so you do not pierce them. Leave about ¼ inch of thickness in the shell so it remains sturdy. Add the peppers and onions to the squash along with the brown sugar and parmesan cheese. Mix well with a rubber spatula, making the squash as smooth as possible. Divide the mixture evenly between the 4 squash shells. Return the squash to a clean baking sheet. Bake for 20 minutes more to heat through. 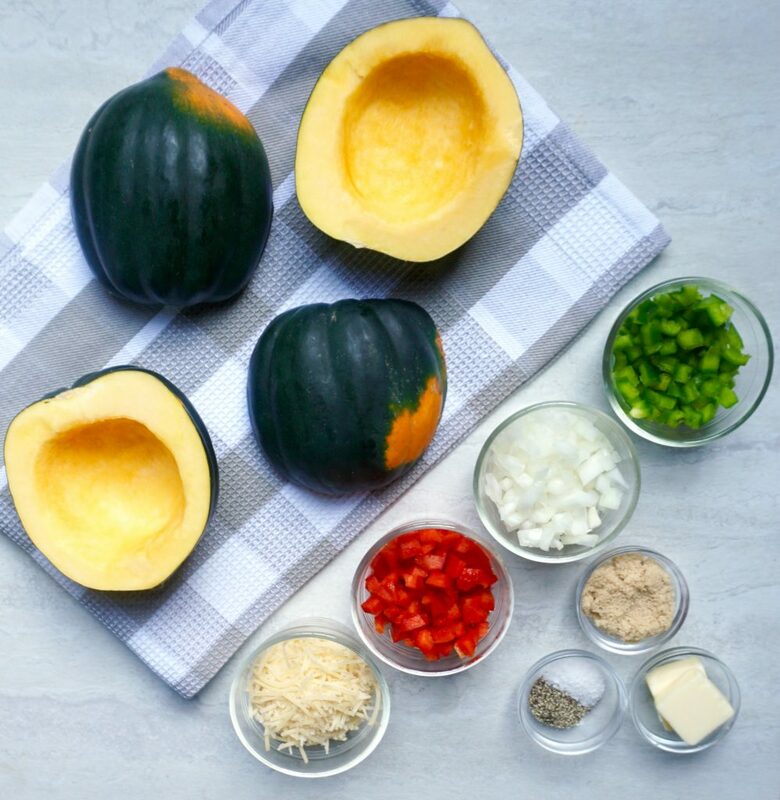 The squash can be frozen before the second baking. When you are ready to cook them, simply defrost them thoroughly and bake for 20 minutes.